“Despite the unemployment rate dropping below pre-Recession levels in recent months, many North Carolinians are still being left behind. 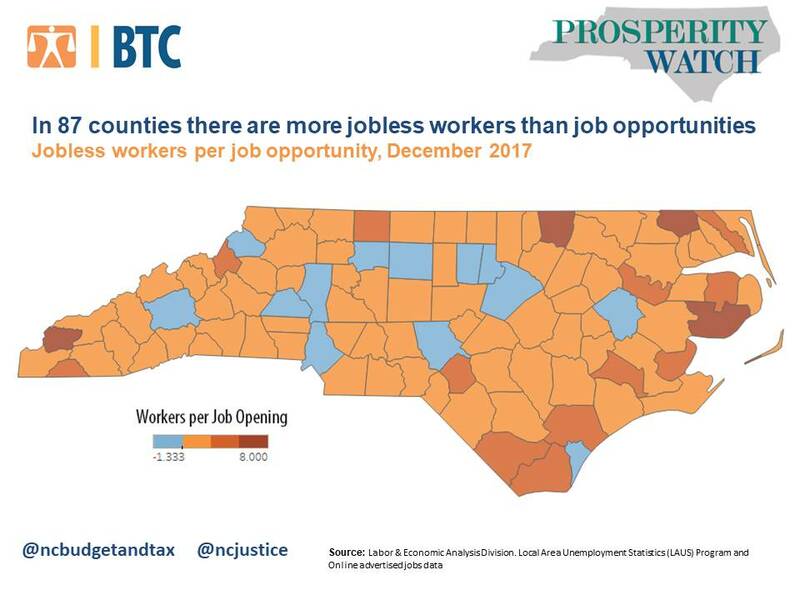 In December of 2017, in 87 of North Carolina’s 100 counties, there were more jobless workers than there were job opportunities. In 44 counties, there were more than two jobless workers for every job. Rural counties have been hit particularly hard by slow job growth. All but two of the 87 counties are rural. Since the Great Recession, job growth has been four time slower in rural counties than their neighboring urban counties. And from 2009 to 2016, more than 40 percent of the state’s new jobs were created just in Wake and Mecklenburg counties. In certain counties, such as Hyde, where there are nine unemployed workers for every job opening, the unemployment rates are as high as 10 percent—more than twice the state average. Additionally, many struggling counties are located in the east, a part of the state that has been slower to recover after the recession.